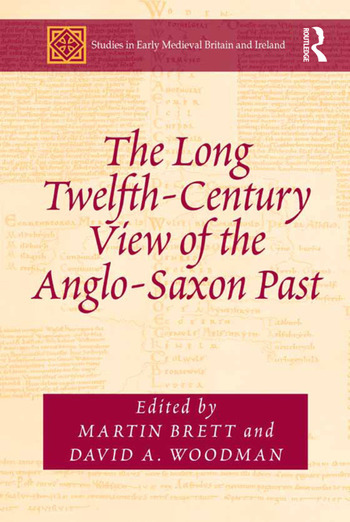 Scholars have long been interested in the extent to which the Anglo-Saxon past can be understood using material written, and produced, in the twelfth century; and simultaneously in the continued importance (or otherwise) of the Anglo-Saxon past in the generations following the Norman Conquest of England. In order to better understand these issues, this volume provides a series of essays that moves scholarship forward in two significant ways. Firstly, it scrutinises how the Anglo-Saxon past continued to be reused and recycled throughout the longue durée of the twelfth century, as opposed to the early decades that are usually covered. Secondly, by bringing together scholars who are experts in various different scholarly disciplines, the volume deals with a much broader range of historical, linguistic, legal, artistic, palaeographical and cultic evidence than has hitherto been the case. Divided into four main parts: The Anglo-Saxon Saints; Anglo-Saxon England in the Narrative of Britain; Anglo-Saxon Law and Charter; and Art-history and the French Vernacular, it scrutinises the majority of different genres of source material that are vital in any study of early medieval British history. In so doing the resultant volume will become a standard reference point for students and scholars alike interested in the ways in which the Anglo-Saxon past continued to be of importance and interest throughout the twelfth century. Introduction, Martin Brett. Part I The Anglo-Saxon Saints: The Viking hiatus in the cult of saints as seen in the 12th century, R. Bartlett; Folcard of Saint-Bertin and the Anglo-Saxon saints at Thorney, Rosalind Love; Bede’s Historia Ecclesiastica as a source of lections in pre- and post-Conquest England, Teresa Webber. Part II Anglo-Saxon England in the Narrative of Britain: Danish ferocity and abandoned monasteries: the 12th-century view, Julia Barrow; Symeon of Durham’s Historia de Regibus Anglorum et Dacorum as a product of 12th-century historical workshops, David Rollason; William of Malmesbury’s diatribe against the Normans, R.M.Thomson; Normandy’s view of the Anglo-Saxon past in the 12th century, Elisabeth van Houts; Richard of Devizes and a ‘rising tide of nonsense’: how Cerdic met King Arthur, John Gillingham. Part III Anglo-Saxon Law and Charter: Historical literacy in the archive: post-Conquest imitative copies of pre-Conquest charters and some French comparanda, J. Crick; The use and abuse of Anglo-Saxon charters by the kings of England, 1100-1300, Nicholas Vincent; Pre-Conquest laws and legislators in the 12th century, Bruce O’Brien. Part IV Art History and the French Vernacular: ‘History’ in Anglo-Norman romance: the presentation of the pre-Conquest past, Judith Weiss; The scribe looks back: Anglo-Saxon England and the Eadwine Psalter, C. Karkov; The Anglo-Saxon tradition in post-Conquest architecture and sculpture, Malcolm Thurlby. Bibliography; Indexes. Dr Martin Brett, Fellow Emeritus of Robinson College, Cambridge University and author of The English Church under Henry I (OUP, 1975). David A. Woodman, Fellow of Robinson College, Cambridge University and Director of Studies in History and Anglo-Saxon, Norse and Celtic. He is author of Charters of Northern Houses (OUP, 2012).